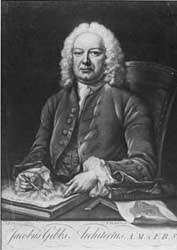 James Gibbs, the architect of St Martin in the Fields in Trafalgar Square, London is mainly known in Twickenham as the designer of the Octagon at Orleans House. This building, allegedly built to accommodate a dinner party for Queen Caroline, was commissioned by James Johnston in about 1718. Gibbs was born into a Scottish Catholic family and was actually destined to enter the church following training in Rome. His sojourn in Rome, where he rebelled against the zealous instruction turned him to architecture. Johnston, also a Scot was at the other end of the religious spectrum and might be thought to have been an unlikely client, particularly in the aftermath of the 1715 Rebellion. In about 1750 Gibbs added wings to the house known as Cross Deep, for its owner, Barnaby Backwell, a banker. Shortly before this he had added a room to Admiral Sir Chaloner Ogle's house, later called Gifford Lodge, facing Twickenham Green. In 1725 he designed ancillary buildings at Whitton Place for the Earl of Ilay (later Duke of Argyll). One of these, known as the Greenhouse but actually a stone building was later converted into a separate house and survived until 1935. Gibbs established a corner in the design of church monuments, collaborating from time to time with Alexander Pope and Michael Rysbrack. Pope sometimes wrote the epitaphs, Rysbrack carved the figures and Gibbs created the settings. Perhaps the best known of Gibbs' designs is the monument to Matthew Prior, who had died in 1721, for which Rysbrack carved the figures and Coysevox the bust of Prior. Pope did not like the bust of Prior without his wig and his relationship with Gibbs may have cooled from this time. Gibbs designed the monument to Pope's friend James Craggs the younger who died from smallpox while living up the road from Pope at the top of Cross Deep. It has been stated that Gibbs designed Pope's Villa for the poet but the evidence for this is fragmentary, relying on the interpretation of an undated letter possibly of 1719. More likely perhaps he advised Pope on later alterations to the villa, as noted in a memoir dated 1751 and held to have been written by Gibbs himself. Horace Walpole's opinion of Gibbs, included in his Anecdotes of Painting in 1771 was fairly indifferent: "…Gibbs, like Vanbrugh, had no aversion to ponderosity, but not being endued with much invention was only regularly heavy. His praise was fidelity to rules, his failing, want of grace."